There is of course some truth in each of these views. Cult wines like Screaming Eagle will still sell out no matter what happens on Wall Street — no one wants to be dropped from the distribution list in bad times because it’ll be impossible to get back on when the economy picks up. And there are wines that are positioned to benefit from a down market (see below) while others suffer. But this only tells us what we already knew, which is that wine isn’t one big market, it is a lot of big, small and medium sized market segments and it is no surprise that they all aren’t affected equally by any trend. People may in fact drink more alcohol in a a down economy — call it wine relief or corkscrew therapy. But even if they do, it doesn’t necessarily mean that they’ll drink more wine, does it? Wine isn’t always the cheapest way to drown your sorrows. And it sure doesn’t mean that they’ll pay more for wine, even if they do drink more of it, because they are likely to trade down to cheaper products. Econ 101 teaches us that total expenditure falls with price when demand is inelastic, as it may be in some wine market segments. And the evidence shows that some but obviously not all wines are good financial investments, but it is important not to over-generalize this effect. When the influential Canadian wine writer Beppi Crosariol recently quoted the importer of wines such as Domaine de la Romanée-Conti on the benefits of wine investment in his column in the Global and Mail he was flooded with comments ridiculing the idea of wine as a general investment strategy. There is lots of evidence that the economic crisis is affected the demand for wine. Restaurant sales have been especially hard hit and grocery store customers are trading down in the quest for good value. But is trading down really the right term to describe this phenomenon? We know from Constellation Brand’s market surveys that some wine buyers are influenced mainly by price, so that trading down to a cheaper product comes naturally to them. Lifestyle wine consumers are unlikely to give up wine during a recession because it would mean more than changing consumption patterns, it would mean sacrificing an important element of their carefully constructed identity. But I don’t think they will necessarily simply trade down to lower priced wine — Carlo Rossi or Two Buck Chuck — either, because that would also undermine self image (to the extent that this is based upon consumption patterns). I believe that people will try to maintain their lifestyle identity through the economic cycle to the extent they can. This is a lifestyle variation on Milton Friedman’s economic theory of the permanent income hypothesis. So while some people will trade down to lower price, others will trade over — to a different idea of wine that allows them to spend less without feeling like they are giving up their lifestyle. I’m still serious about wine, their choices say, but I don’t take my self so seriously all the time. I like to have fun with wine and so I’m buying wine that reflects this fact now. Barefoot Cellars: Trading Down or Trading Over? This, I argue, is what’s behind the recent success of Barefoot Cellars wine, which has experienced rising sales in the decling market. It is pretty clear that consumers are trading down or trading over to Barefoot. Why? Barefoot Cellars is a wine with a casual image — kick off your shoes and relax! — but the wines have a serious side, too. Barefoot wines are entered in various wine competitions and the labels proudly display the gold medals they’ve earned, something that gives these products credibility on the Wine Wall despite their competitive price point. 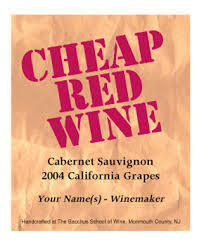 (Barefoot California Zinfandel retails for $6.99 or less in most markets.) Wine critics have given some of the wines favorable ratings and they often appear on published “Best Buy” lists. The Barefoot brand was founded in 1965 by Davis Bynum and passed through various hands before being purchased by Gallo in 2005. (Here is a history of the brand.) Jeremy Soine, a former student of mine at the University of Puget Sound, is the brand’s manager; I asked him why it has been so successful. Here is our Q&A. Who is buying Barefoot and why? Barefoot Wine is marketed to the “young at heart.” The idea of “getting barefoot” is universally appealing, whether you are 25 years old or 75 years old. At the end of the day, most of us look forward to that moment where we can “kick our shoes off” and disconnect for a few minutes from our hectic lives. What can you tell me in terms of sales trends? Barefoot Wine is one of the top selling wines in the United States, and sales growth continues to significantly outpace the wine category. The sales growth of Barefoot has actually increased during the past six months, and I believe this is because people are seeking out better values as they have fewer extra dollars to spend. Much of Barefoot’s popularity has occurred during the past few years, but many people don’t realize that Barefoot Wine was actually started in 1965 by Davis Bynum, who is not now famous for his Pinot Noirs. Have you changed your marketing strategies in any way to compensate or take advantage of the changing market conditions? Barefoot is the most awarded Winery in U.S. wine competitions for under $15 per bottle, and we actively communicate these awards to people by placing medallion stickers right on the bottle. We believe that the medallions give people the confidence that they are buying a wine that has been recognized by wine critics. Do you think that Barefoot’s succcess is due mainly to the trade-down effect — that is, is it driven by the poor economic times, with consumers trading down to cheaper products? Or is there more to it than that? Barefoot does not spend money on traditional advertising like other large wine brands. Rather, we donate wine to local non-profit organizations. This allows people to try Barefoot wines, and also frees up funds for non-profit organizations. In 2008 Barefoot Wine will be poured at more than 3000 non-profit events in most communities in the United States. We believe that this grass roots approach will win in the end because people appreciate these donations, will love the wine and will recommend the wine to their friends. Fewer than half of all wine drinkers have even heard of Barefoot Wine, and we are fine with that because people want to “discover” wine, not be mass-marketed to through television ads or billboards. So Barefoot seems to have benefited from the trading down effect, but I think you can also see a trading over effect. Paying less? Yes. But buying a different idea of wine: relaxed but not unsophisticated and with a social agenda that fits the times. I don’t want to push the Barefoot case study too far — to over-generalize it — but I think there’s something to be learned from this brand’s success.